The first good thing I can say about August is that for some reason, unbeknownst to me, you can always find a fairly convenient parking spot despite its location in the 1200 block of South 13th Street in the Bella Vista section of South Philadelphia. It also helps that the food is pretty damn good. This cash-only BYOB isn’t fancy but there is an atmosphere of congeniality and care that owners, MaryAnn Brancaccio and Maria Vanni have managed to create. Our server, Adrienne, was both patient and attentive, especially in light of the fact that half of our party of 6 were nearly 30 minutes late in arriving. She opened our wines and when we were finally settled, recited the evening specials. 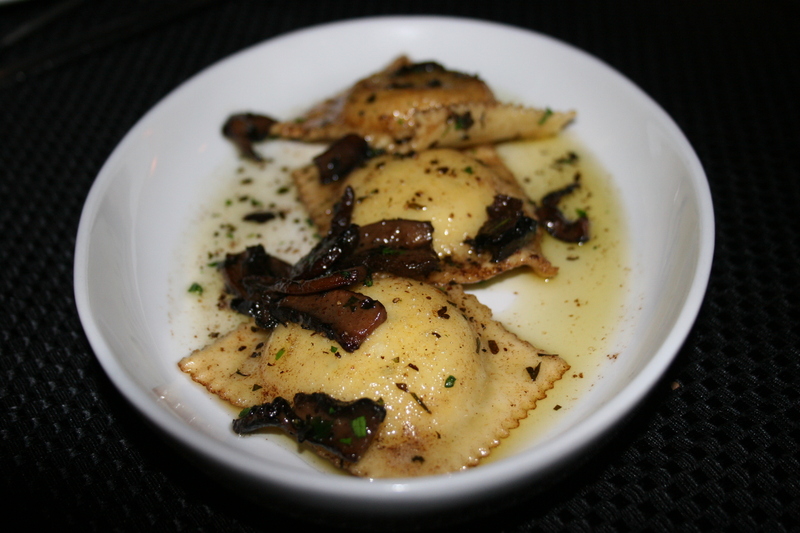 I would describe the offerings at August as Italian with a twist. There are always a few items that seem to stray from the heart of Italian cooking yet they receive an infusion of the country just the same. We had a bevy of nice wines for the evening and much to discuss over our meal as we went over our itinerary for our San Francisco/Napa trip which is now less than seven days away. I brought with me a 2007 Ancient Peaks, Cabernet Sauvignon, Paso Robles, CA. I had read a lot about this wine mostly from e-mails sent from a west coast wine shop. I had been looking for it here on the East Coast for over a year and I stumbled across it at Wine Works in Marlton, NJ. 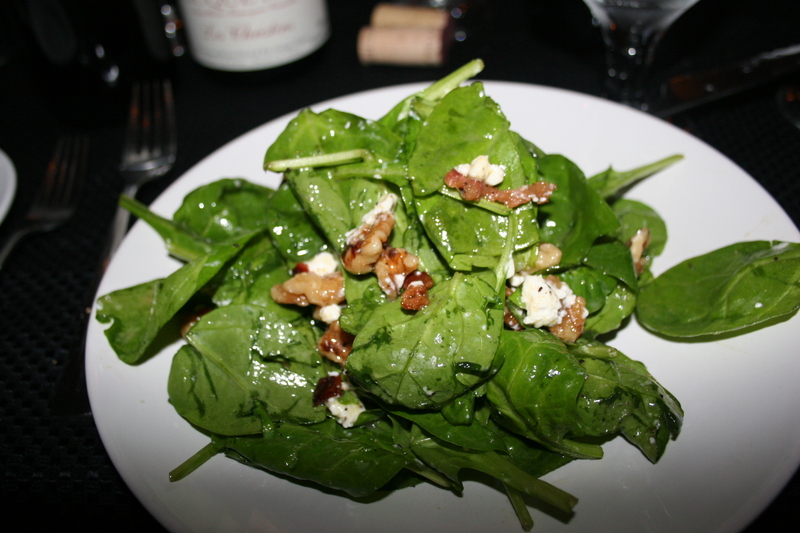 It has all the full flavors of a fruit-filled cab without those big Napa Cab prices. Joe had stopped at Salina Liquors and picked up a 2006 Bodega Renacer Punta Final, Riserva Malbec, Mendoza, Argentina. This one offered great value with full Malbec flavors and a smooth finish. Gerry had two wines. His first was a 2006 Perrin et Fils, Vacqueyras Les Christins. I loved the sweet nose on this one with strawberries and roses coming through. On the palate there was plenty of red fruit in a silky smooth package. His other wine was another California Cab. This one was the 2007 Rush Vineyards, Napa Valley Cabernet. Once again, a nice dark cherry and chocolate nose and the taste pleasant enough but with all of the really good Napa Cabs that Gerry drinks this one falls a little short of the others. 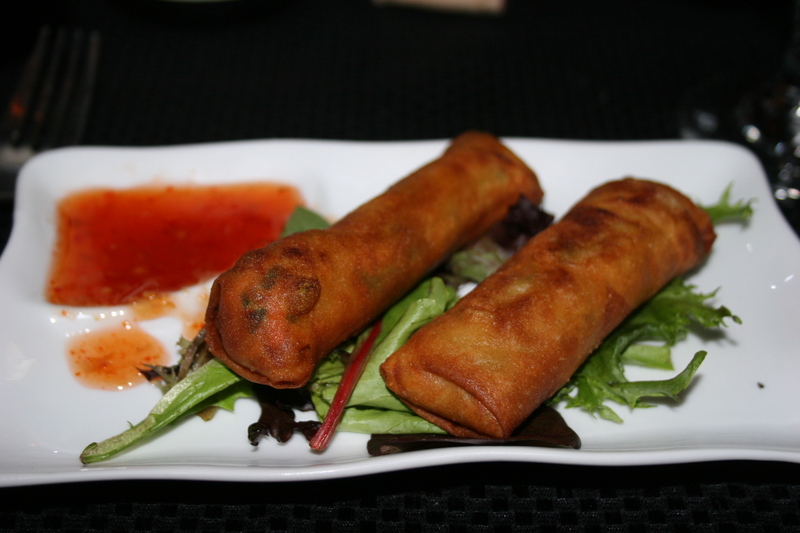 Left to right are Carol B.’s “August rolls”, two vegetarian spring rolls with a tangy dipping sauce, JoAnn B’s Spinach Salad and Gerry B.’s Shrimp sauteed with garlic and chili oil. 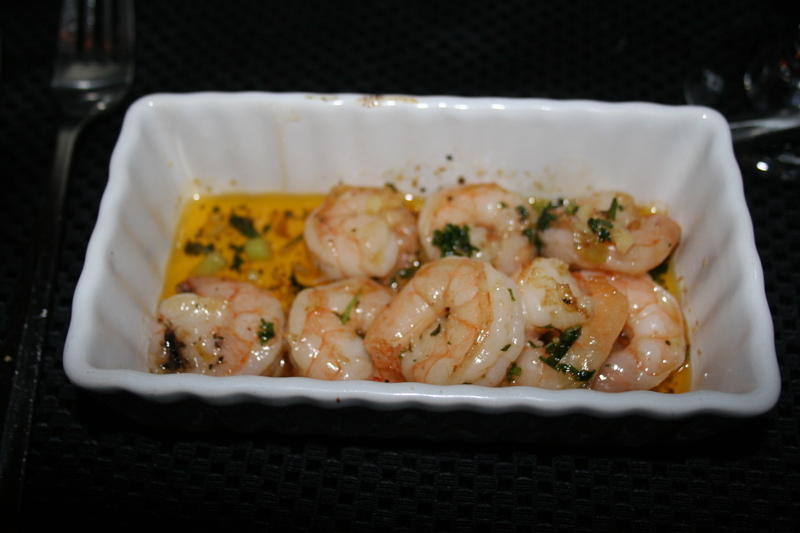 All of the choices are just the right portion to serve as a nice prelude to the main course. 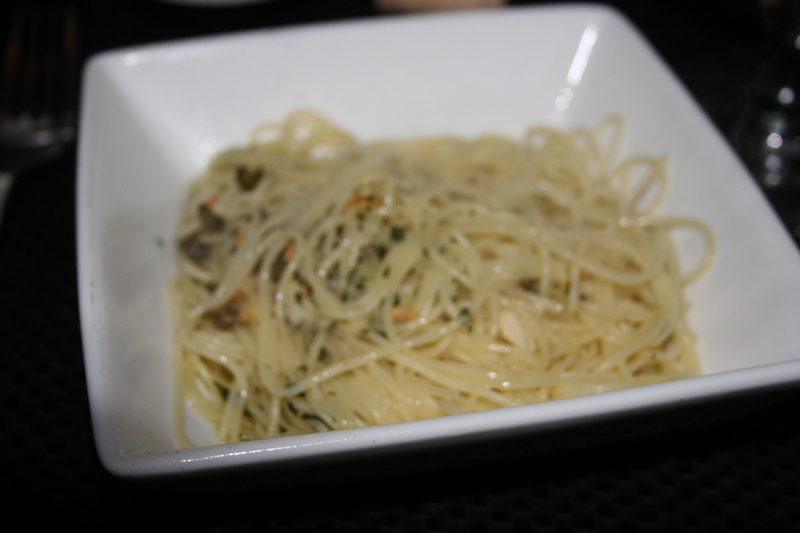 My wife, Kathy, ordered the raviolis with mushrooms and brown truffle butter sauce and I was happy with my choice of the angel hair pasta aioli with capers; made even better when Gerry poured his left over sauce on top of the remainder of my dish adding a potent garlic flavor to the pasta. Adrienne was nice enough to write down the “specials” for me as one of the difficulties of writing a food blog is trying to remember what went into the specials. 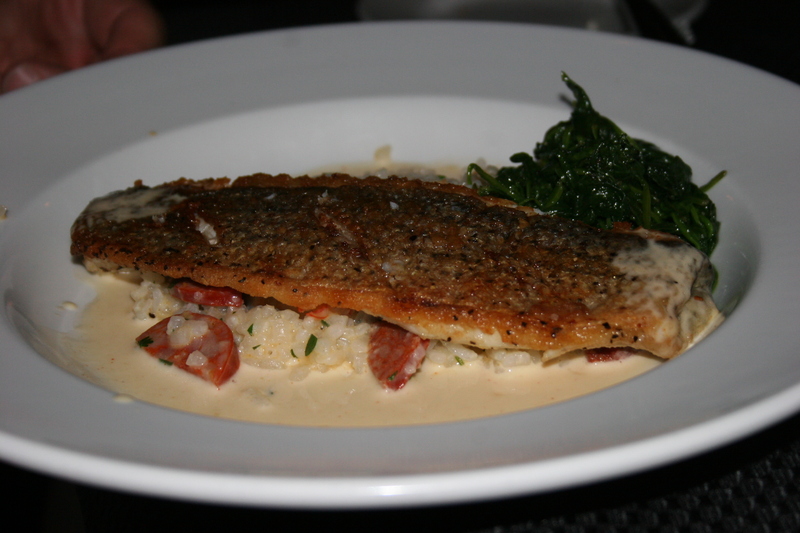 It’s easy enough to go to the restaurants web site for entrees from their regular memo but those specials always create a special problem. Hey, maybe that’s why they are called “specials”!! 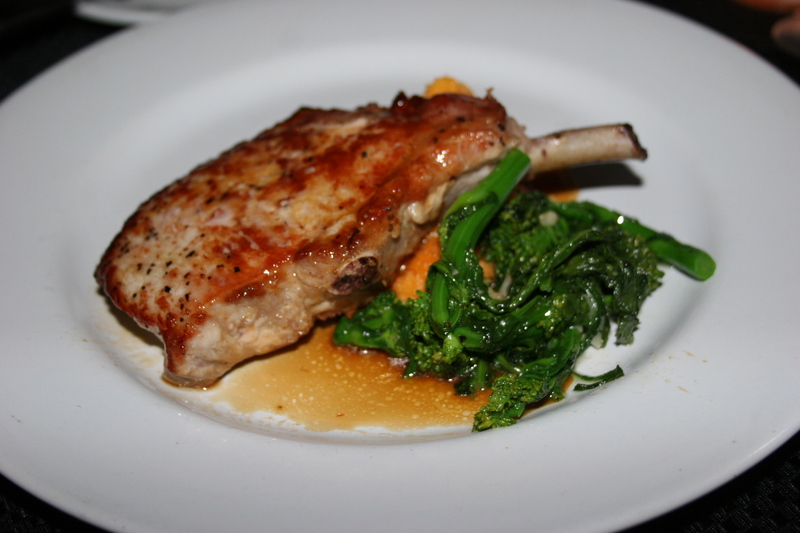 Kathy and Carol both had the Pan Seared Pork Chop with maple mashed sweet potatoes and broccoli rabe. 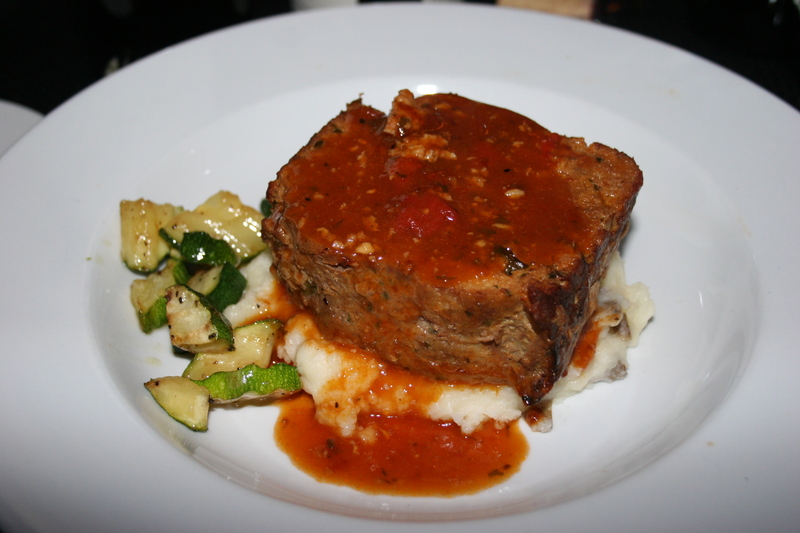 The chop looked to be cooked perfectly and seasoned well and I think both of them enjoyed their selection. 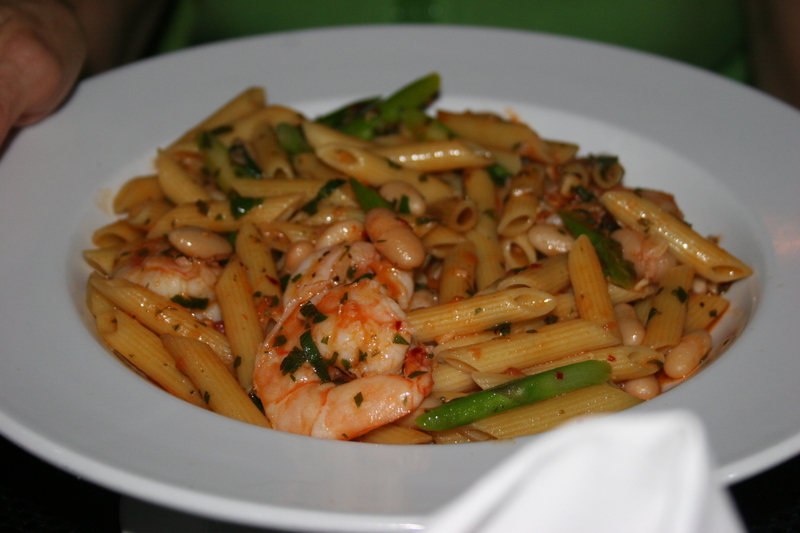 JoAnn had the Penne pasta with jumbo shrimp sauteed with garlic, white beans and asparagus in extra virgin olive oil with a touch of tangy marinara sauce. Yikes, I take back what I said about this not being a true Italian cuisine. She thought the dish was full of flavor and well prepared. We spent a lot of time discussing our trip and what we would be doing each day. We have some great winery visits and some spectacular dinners planned and I will be posting the final update here on my blog in the next day or two. Meanwhile, as we chatted, Maria Vanni was out front making sure everything was good with our meal. That’s the kind of personal touch that so many places forget and it’s one of the things that builds loyal and repeat customers. 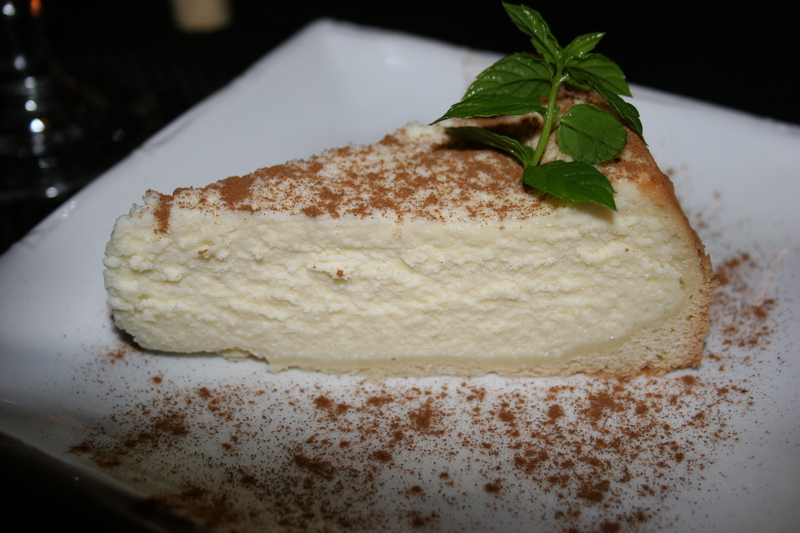 We topped off our meal with most of our group sharing a couple of pieces of the house signature dessert, Aunt Leena’s Cheesecake, a very light cream cheese cake dusted with a cinnamon. I was the lone wolf who opted for the Affogato, vanilla ice cream served in a shot of espresso and topped with a sambuca whipped cream. 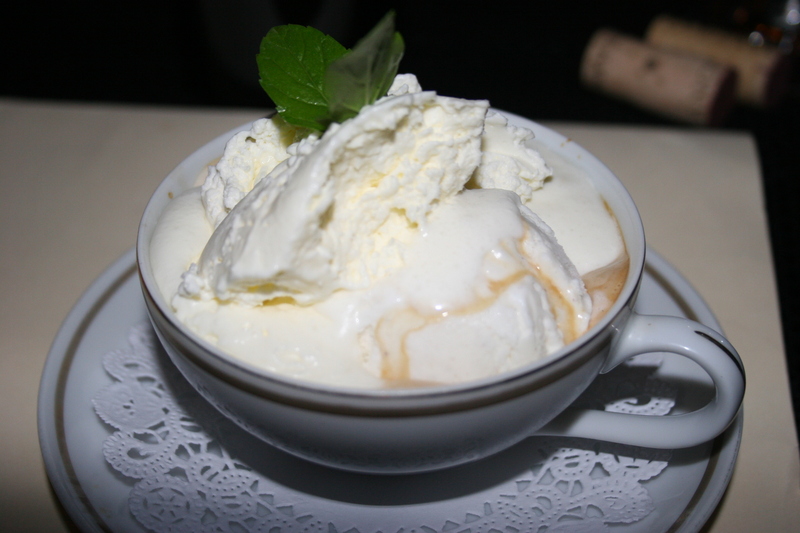 I’m not sure if I ordered this because I thought it would taste good or I just liked saying “AFFFFogatttoooo”. Whatever the reason, I was pleased with my choice. It was delicious and unique; great flavors and the perfect ending to a good meal. There are many choices for dining in South Philly. 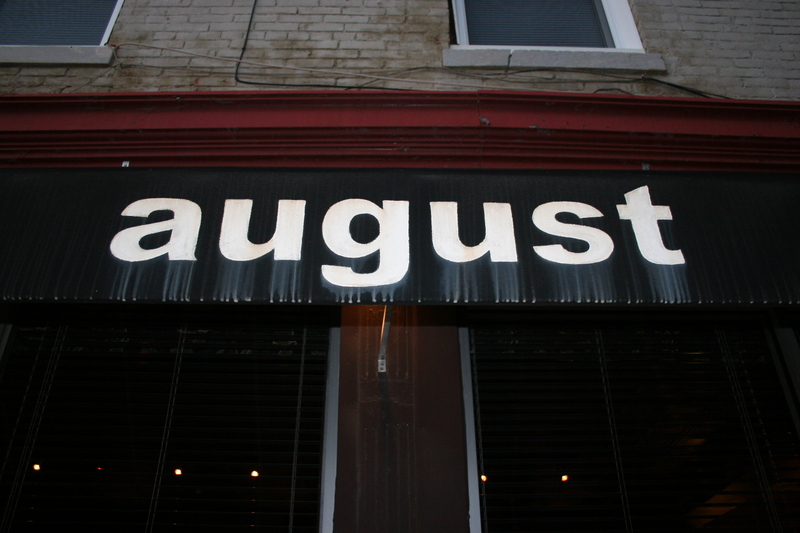 August can certainly be recommended as an excellent pick for fine food and service.